Fluid power hydraulics specialists play a key role when it comes to the assembly, testing, installation, and maintenance of fluid power equipment. They keep the machines running optimally. The equipment can control, boost, or transmit power using pressurized liquid or gas. The professionals find jobs in different sectors, including healthcare, aerospace, robotics, agriculture, and more. The work environments for fluid power hydraulic specialists differ due to the wide variety of applications. A substantial number of specialists work in industrial settings handling daily duties on the production floors. Some fluid power specialists find employment in testing facilities or laboratories as part of research and development teams. They analyze drawings, blueprints, and specifications for the fluid power equipment. The professionals also make precision parts that require high levels of accuracy. The use of sensitive measuring instruments and drilling as well as milling machines is common. The career involves a lot of shaping and grinding. As can be expected, technical certification and training provide a solid foundation for individuals interested in entering or advancing in this highly technical field. Obtaining good qualifications and professional certification gives you a distinct advantage when applying for jobs. 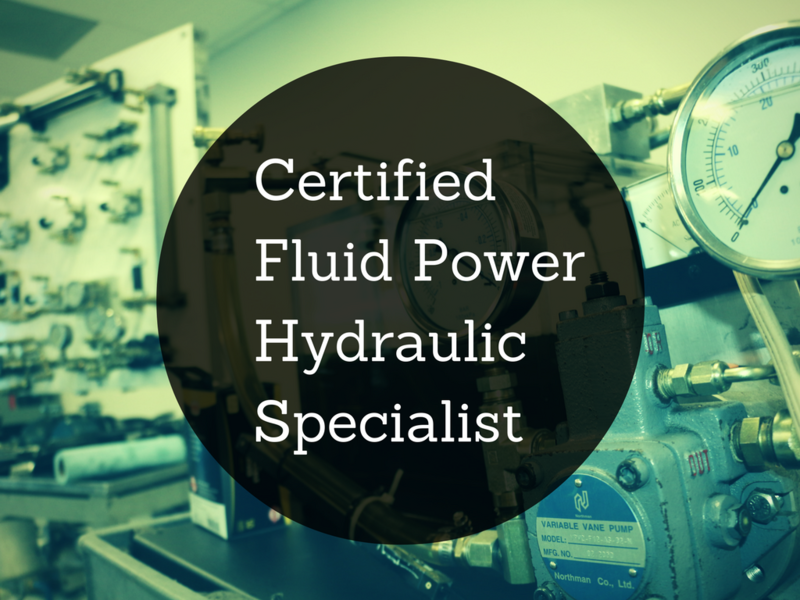 Certified fluid power hydraulic specialists generally qualify for better-paying positions in various sectors. The credentials demonstrate your skills and ability to handle specific tasks. Voluntary certification in the field is handled by The International Fluid Power Society (IFPS). Specialist designation options available to graduates and experienced professionals include the fluid power certified mechanic and fluid power certified technician credentials. To take the test, you are required to register by submitting a test application. This must be done at least 30 days before your requested or preferred test date. The International Fluid Power Society will process the application and send a study manual. Alternatively, you can download the study manual on the IFPS website. The manual is available for a fee for non-members while members receive the document free of charge. Preparing well for the specialized IFPS Certification tests is a practical way to ensure success. The International Fluid Power Society offers a wide variety of preparatory tools designed to improve your understanding of the manuals and test questions. 1.) Pre-test Questions – the specialist tests are complemented by online pre-tests that provide a feel of the examinations. 3.) Certification placement indicator – designed to help you make the right decision when choosing the ideal certification option. 4.) Core competency reports – provide much-needed insights and feedback in the event that you fail the test at first attempt. The reports allow you to identify your weak points. They include raw score results and information showing how questions correspond to various examination sections. 5.) Study manuals – IFPS offers well-formulated manuals that cover all available tests. The documents are always kept up to date. 6.) Interactive Q&A game – designed to provide an interactive way to test your knowledge prior to the certification examination. 7.) Certification review sessions – available through NTT Training and third-party accredited instructors. Review our Fluid Power training courses or Contact NTT Training for more information. Attending a preparatory seminar is another viable way to boost chances of success. By taking part in a fluid power hydraulic specialist seminar, you gain an in-depth knowledge of technical skills required in the profession. The seminars are ideal for individuals involved in the drafting and designing of hydraulics schematics or systems. They make it easy to understand the principles guiding standard practices that are supported by National and International Standards. NTT Training hosts regular seminars aimed at exposing you to various core topics, including system design, load and motion analysis, troubleshooting, system analysis, fluid filtration, and more. If you’d like more information, Contact NTT Training today!